REDUCED FOR SPRING SKIING!! Condo on Bromley Mountain with the Best View!!!! 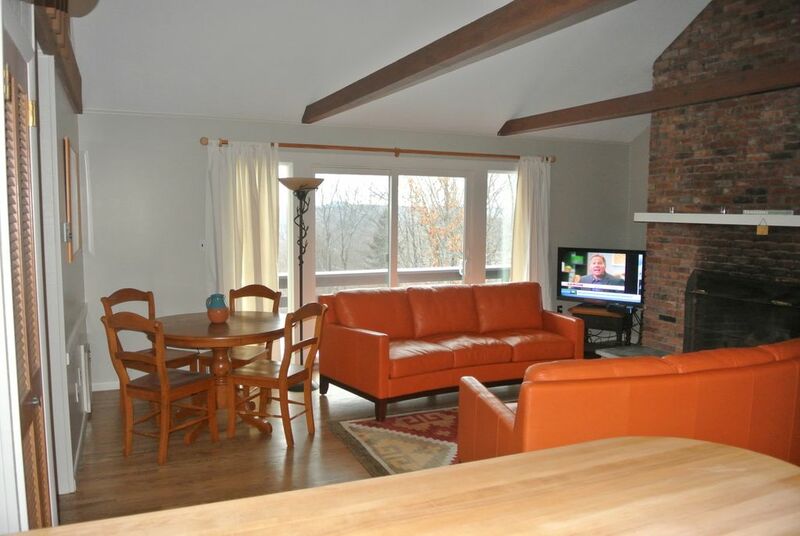 Newly renovated Condo located in Bromley Village on Bromley Sun Mountain with the best views in the village. Ski-In Ski-Out! Relax on brand new leather sofas in front of beautiful brick fireplace with unlimited firewood! Brand new carpeting and hardwood floors refinished in living room! New flat screen TV, Wifi and access to community fitness center and heated outdoor pool for use in summer. Master bedroom has queen bed (sleeps 2) and second bedroom has bunk beds and an additional twin (sleeps 3). Condo will be set up with all linens based on occupancy. Bromley Mountain is a wonderful place filled with great skiing or riding, friendly people, amazing food and good music for apres' skiing. I grew up skiing in southern Vermont as a child and now share it with my children. It is a place where you will spend quality time with family and friends! Generations have planted there roots here and are making wonderful memories. It is wonderful not to have to drive to the mountain as you can ski in and ski out and to have an amazing view ! Great condo! Easy to walk a little to the slopes! Comfortable! Nice property. You need to bring all condiments, Tupperware etc and stuff for cooking. But kitchen was good and the rest of the house was comfortable. We have now stocked the kitchen with tupperware, tinfoil, and plastic bags so you can pack lunches for the slopes. However, the Wild Boar located in the Bromley lodge does have great food, great service and great beer too! The kitchen has a Keurig coffee maker, and is stocked with K cups, sugar and creamers since we know that morning coffee is a must! (There has always been many pots and pans and utensils). There is plenty of firewood and fire starters as well! This condo has everything you need and it is newly renovated with hardwood floors (so super clean) and new carpeting in the bedrooms. It also has all new mattresses and bedding. You will definitely enjoy your stay and love the ease of ski on and ski off! Very nice location and condo was awesome. Close to the slopes and great view of Stratton from the deck! Whatever the season Bromley Village has it all! Bright, airy unit with great mountain views. The condo was well maintained and kitchen fully equipped. We enjoyed the complimentary wood and relaxed by the fire. The condo is a short walk to the slopes and complimentary shuttle service is also available. Any season, this location is a great spot to relax, unwind and enjoy the Green Mountains of Vermont. Darlene was a pleasure to work with and most accommodating. We will be coming back!